← A picture of Gumby hatching her jellybeans. My parrot, Rufus, had a temper tantrum last night…. A parrot is like a child with the Terrible Twos. Having a parrot is a big commitment. It takes patience, lots of love, and a tolerance to extreme pain…. Last night, Rufus was upset that he was not in charge, and he bit my finger tip, the one I use on my mouse buttons. I’m trying to type with a big bandage on. Anyway, being bitten by a Congo African Grey Parrot is like getting pinched with a big pair of wire cutters: very painful and very bloody. Ouchie! 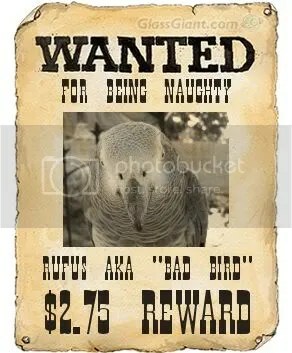 Rufus likes to be naughty, very naughty sometimes. He is very strong willed, and will not follow the house rule. Rufus does not like this rule at all. He wants to wander through the house tearing our things up. The deal is, Rufus can stay out of his house as long as he follows the rule. Then, he goes back in his house, very very reluctantly.